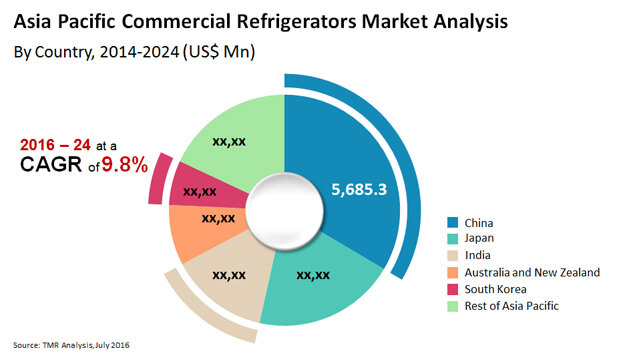 The presence of a large number of domestic and international manufacturers has rendered the landscape in the Asia Pacific commercial refrigerators market highly competitive. As per Transparency Market Research (TMR), Midea Group and Haier Electronics Group Co. Ltd. led the Asia Pacific commercial refrigerators market in 2015. These companies have been increasingly focusing on product innovation and improving customer experience in order to gain a competitive advantage in the market. For instance, Liebherr entered into a partnership agreement with Redmond based Microsoft Corporation in April 2016 for the development of smart refrigerators based on the premise of the Internet of Things (IoT). More such developments are expected to be reported from the market. A substantial number of enterprises in the market are looking to expand their product portfolio in order to achieve sustainable growth. Apart from investing in product innovations, the key players are also focusing on competitive pricing to keep pace with the prevailing competition. However, according to TMR, improvements in retail channels hold the key for long-term growth for players operating in the Asia Pacific commercial refrigerators market. The booming food and retail industry in Asia Pacific is fuelling demand for refrigerators with innovative design. Unlike the refrigerators used in domestic applications, the ones used for commercial purposes have a high storage capacity and an expansive operating temperature suitable for a plethora of product types. The growth witnessed in the Asia Pacific retail industry is also attributed to the increasing consumption of packaged food and beverages. “Due to the hectic lifestyle of consumers and their increasing willingness to pay for convenience food, the demand for packaged food and beverages is expected to surge exponentially in the near future,” said a TMR analyst. This is a primary factor driving the market for commercial refrigerators in Asia Pacific. “Furthermore, the increasing number of supermarkets, cafes, and restaurants will substantially bolster sales of commercial refrigerators in Asia Pacific,” he added. Besides this, the importance of energy efficiency in commercial and consumer appliances has considerably increased in the last few years. The rising awareness about green appliances has paved the way for the advent of eco-friendly commercial refrigerators. Contrary to this, the high cost procurement and maintenance costs of commercial refrigerators are hindering the growth of the market to an extent. Due to their high price, small retailers tend to look for more affordable alternatives. This limits the sales of commercial refrigerators to smaller establishments such as cafes and local retailers. In addition, the availability of alternate packaging solutions such as temperature-control packaging is hindering the sales of commercial refrigerators in Asia Pacific. Dramatic changes have been witnessed in commercial appliances over the last few years. The high energy consumption of these appliances has led to the introduction of smart and solar powered commercial refrigerators. With leading name brands venturing into the development and manufacturing of solar-based commercial refrigerators, the market witnesses lucrative prospects to gain from in the near future. The commercial refrigerators market is segmented as follows. 0.5 Cu. Ft. to 3.0 Cu. Ft.
3.1 Cu. Ft. to 6.0 Cu. Ft.
6.1 Cu. Ft. to 9.0 Cu. Ft.